Messier 41 (M41) is a bright open star cluster located in Canis Major constellation. It lies near Sirius, the brightest star in the sky. Messier 41 has an apparent magnitude of 4.5 and lies at an approximate distance of 2,300 light years from Earth. It has the designation NGC 2287 in the New General Catalogue. M41 is very easy to find as it lies about 4 degrees south of Sirius, the Dog Star, one of the nearest stars to Earth. M41 can be seen in the same binocular field with Sirius and Nu-2 Canis Majoris, an evolved orange giant with a visual magnitude of 3.95. The cluster forms a triangle with the two stars. In clear, dark skies, it is visible to the naked eye. The cluster is relatively loose and can be resolved in a small telescope. It is best observed at low magnifications. 10×50 binoculars show a large faint patch of light, while larger binoculars resolve some of the stars in the cluster. Small telescopes (4-inch) resolve about 50 stars, while 6-inch and 8-inch telescopes show many more fainter members. The best time of year to observe M41 is in the months of December, January and February. Messier 41 occupies an area of 38 arc minutes in apparent diameter, roughly the size of the full Moon. The cluster has a true diameter of 25 light years. Its estimated age is between 190 and 240 million years. M41 is moving away from us at 23.3 km/s. 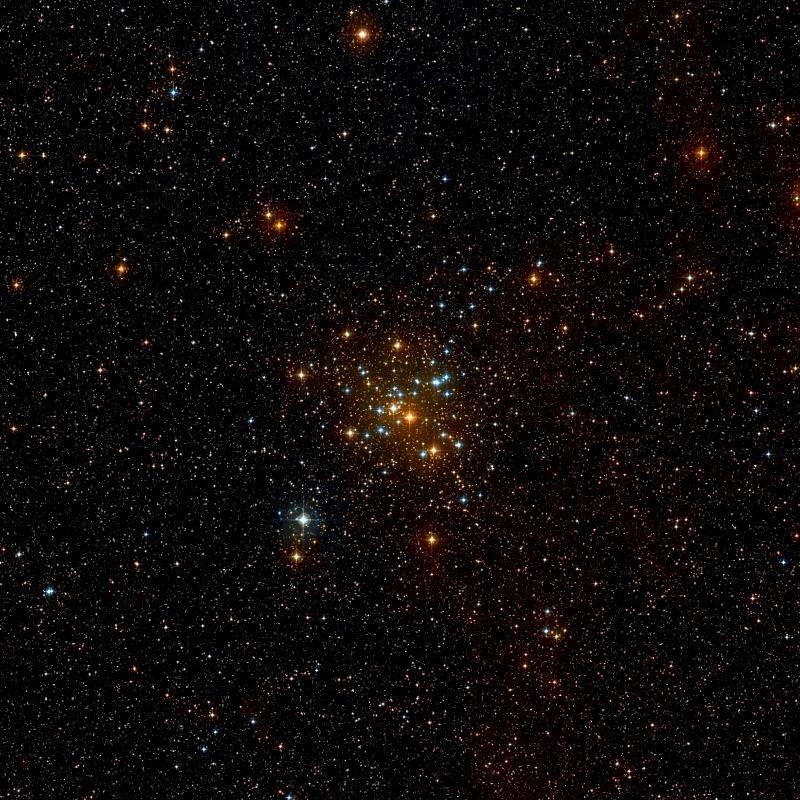 The cluster is classified as Trumpler type I,3,r, which means that it is detached from the surrounding star field with strong concentration at the centre (I), it consists of both bright and faint stars (3), and it is richly populated (r), with 100 or more stars. Messier 41 contains about 100 members, including several red giants and a number of white dwarfs. 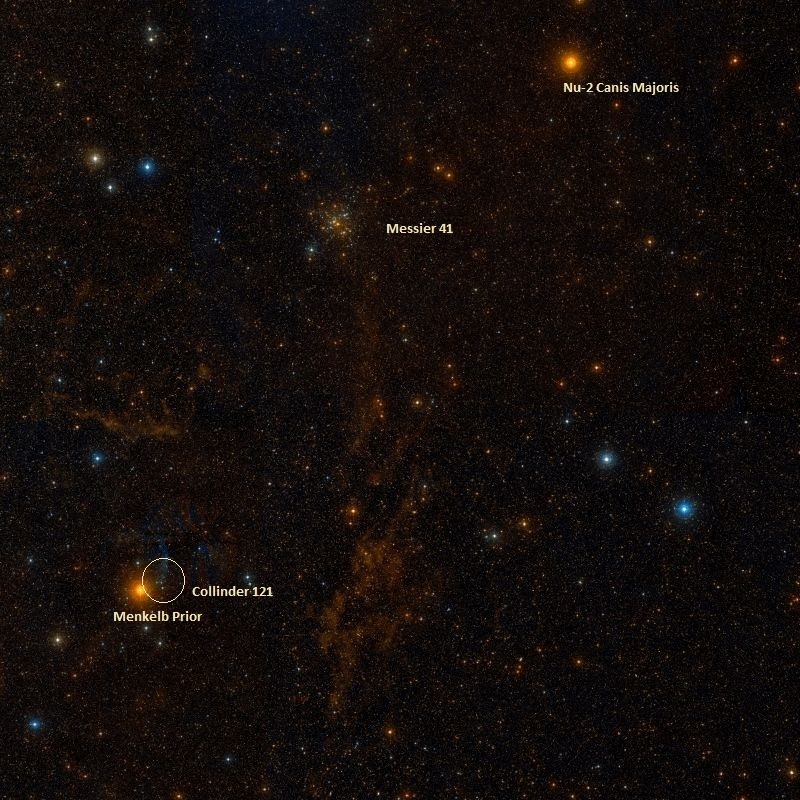 The brightest among the giant stars is a K3-type star with a visual magnitude of 6.3, visible near the centre of the cluster. The orange giant is about 700 times more luminous than the Sun. The hottest star in M41 has the spectral classification A0. 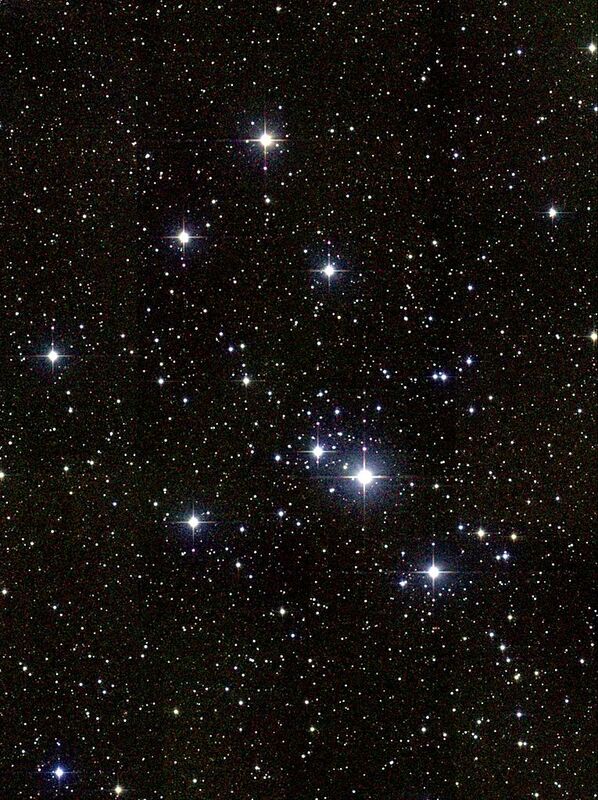 The open cluster Collinder 121 lies only about 60 light years from M41, near the relatively bright star Menkelb Prior (Omicron-1 Canis Majoris). Collinder 121 is a considerably fainter grouping, but suspected to be physically related to M41 because of their proximity. The two clusters are separated by 4.6 degrees. …some of the fixed stars have tails. And for this we need not rely only on the evidence of the Egyptians who say they have observed it; we have observed it also ourselves. For one of the stars in the thigh of the Dog had a tail, though a dim one: if you looked hard at it the light used to become dim, but to less intent glance it was brighter. It is uncertain whether the philosopher saw the cluster, a comet, or part of the Milky Way near the star d Canis Majoris. 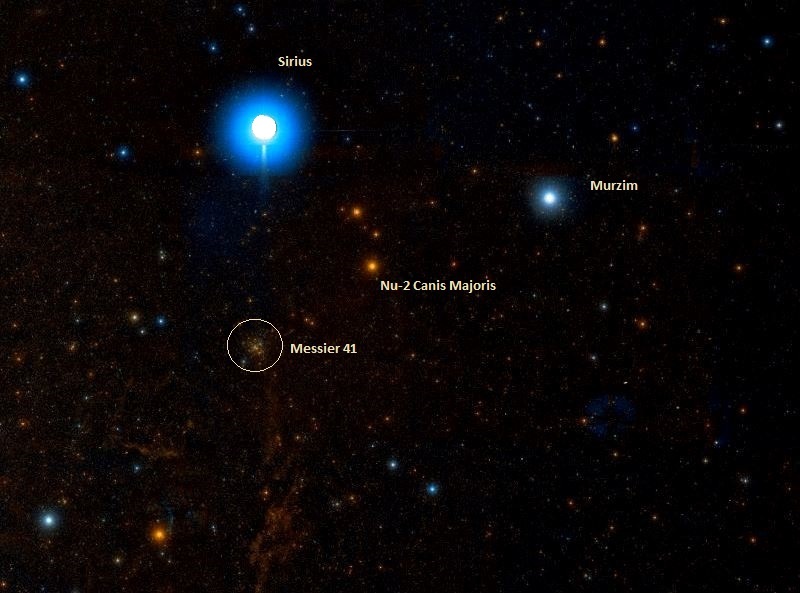 The star 12 Canis Majoris, A B7-type blue giant, lies in the same line of sight as M41 and can be seen at the southeastern edge of the cluster. The star is located much closer to us than M41, at a distance of 668 light years, and is not a member of the cluster. 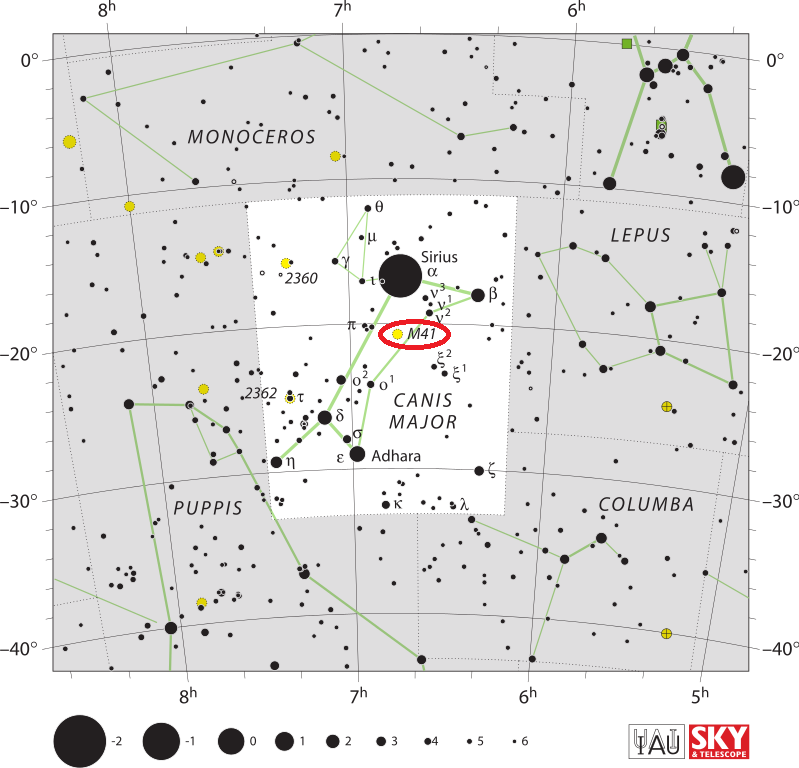 English astronomer John Flamsteed discovered the open cluster independently on February 16, 1702, as did the French astronomer Guillaume Le Gentil in 1749. A double star, in a scattered cluster, on the Great Dog‘s chest. A [mag] 9, lucid white; B 10, pale white. This was registered by Messier in 1764, as a “mass of small stars;” but it is divided into five groups, of which the central one is the richest, and marked by three bright stars forming a crescent. In the np [north preceding, NW] is the open double star which is here estimated; and 41 Messier may be struck upon by running a ray from Aldebaran, through Epsilon in the centre of Orion’s belt, and from thence between Sirius and Mirzam to about 4deg in the southeast space beyond them. But a beacon is rather acceptable in so low a declination, the tyro may hit his object by first directing his telescope – charged with a low power – upon Sirius, and then depressing it 4deg 5′, when in about a minute a pair of 8th magnitudes will appear, constituting 233 and 236 P. Hora VI., and in about another minute, the cluster under discussion will follow. Messier 41. Atlas Image mosaic obtained as part of the Two Micron All Sky Survey (2MASS), a joint project of the University of Massachusetts and the Infrared Processing and Analysis Center/California Institute of Technology, funded by the National Aeronautics and Space Administration and the National Science Foundation.